An anterior cruciate ligament (ACL) injury is a tear in a ligament of the knee. The ACL is a tough band of fiber in the middle of the knee joint. It connects the lower leg bone to the thigh bone. The ACL keeps the knee stable during movement by keeping the lower leg bone from sliding too far forward. An injury to this ligament can make the knee unstable. The injury may be partly torn or a complete tear. You will be asked about your symptoms and how you injured your knee. A physical exam will be done and your doctor will test your knee's strength and stability. Rest—Avoiding activities that cause pain. Ice—In the first few days, icing may help slow swelling. Elevation—Keeping the knee elevated at rest can help fluids drain out of the area. The ACL can't heal by itself, but surgery may not be needed if the knee is stable. This option may be best in those who are elderly or less active. Those who are highly active or want to return to sports will probably need surgery. A knee brace can help keep the knee stable. Crutches may also be helpful in the beginning. Over-the-counter or prescription medications may be used to reduce pain and swelling. Surgery may be needed for those who are young and active or those who want to return to intense sports. It may also be needed if other ligaments of the knee are damaged or the knee is unstable. The surgery will use tissue from another part of the body to make a new ligament. It can take several months for the graft to become strong enough to return to sports. The physical therapist can test your knee movement and develop a recovery plan. Therapy can include exercise and stretching programs to help balance the muscles of your legs. This can help stabilize the knee and decrease the risk of further injury. Try plyometrics, a form of exercise that uses explosive movements. When jumping and landing or turning and pivoting, your hips and knees should be bent, not straight. Strengthen and stretch the muscles of your legs. Anterior cruciate ligament (ACL) injury. EBSCO DynaMed Plus website. Available at: http://www.dynamed.com/topics/dmp~AN~T114675/Anterior-cruciate-ligament-ACL-injury. Updated June 26, 2017. Accessed March 26, 2018. 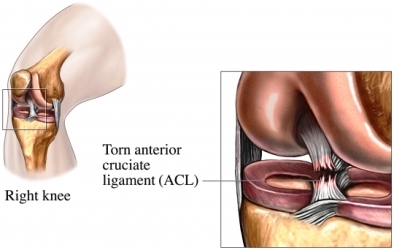 Anterior cruciate ligament injuries. Ortho Info—American Academy of Orthopaedic Surgeons website. Available at: http://orthoinfo.aaos.org/topic.cfm?topic=A00549. Updated March 2014. Accessed March 26, 2018. Anterior cruciate ligament injuries: treatment and rehabilitation. Encyclopedia of Sports Medicine and Science website. Available at: http://sportsci.org/encyc/aclinj/aclinj.html. Updated April 18, 1998. Accessed March 26, 2018. ACL Injury: Does It Require Surgery? American Academy of Orthopaedic Surgeons website. Available at: http://orthoinfo.aaos.org/topic.cfm?topic=A00297. Updated September 2009. Accessed March 26, 2018. Griffin LY, Agel J, et al. Noncontact anterior cruciate ligament injuries: risk factors and prevention strategies. J Am Acad Orthop Surg. 2000;8:141-150. Knee sprains and meniscal injuries. Merck Manual for Health Care Professionals. Available at: http://www.merckmanuals.com/professional/injuries%5Fpoisoning/fractures%5Fdislocations%5Fand%5Fsprains/knee%5Fsprains%5Fand%5Fmeniscal%5Finjuries.html. Updated August 2017. Accessed March 26, 2018. Ligament injuries to the knee. John Hopkins Medicine website. Available at. http://www.hopkinsmedicine.org/healthlibrary/conditions/adult/orthopaedic%5Fdisorders/ligament%5Finjuries%5Fto%5Fthe%5Fknee%5F85,P00926. Accessed March 26, 2018. 7/6/2009 DynaMed Plus Systematic Literature Surveillance http://www.dynamed.com/topics/dmp~AN~T114675/Anterior-cruciate-ligament-ACL-injury: Prodromos CC, Han Y, et al. A meta-analysis of the incidence of anterior cruciate ligament tears as a function of gender, sport, and a knee injury-reduction regimen. Arthroscopy. 2007;23:1320-1325. 5/12/2014	DynaMed Plus Systematic Literature Surveillance http://www.dynamed.com/topics/dmp~AN~T114675/Anterior-cruciate-ligament-ACL-injury: Anterior cruciate ligament injuries: Diagnosis, treatment, and prevention. Pediatrics. 2014 Apr [Epub ahead of print].